The Amano Artisan Chocolate range comprise a 70% Madagascar bar, cocoa nibs and bulk chocolate. All Madagascar Amano chocolates are made with premium quality cacao grown on fair trade certified farms in the Sambirano region of Madagascar. The Madagascar cocoa is shipped to the Amanao chocolate factory in Salt Lake City, USA, where the chocolate is made with custom-built machinery. 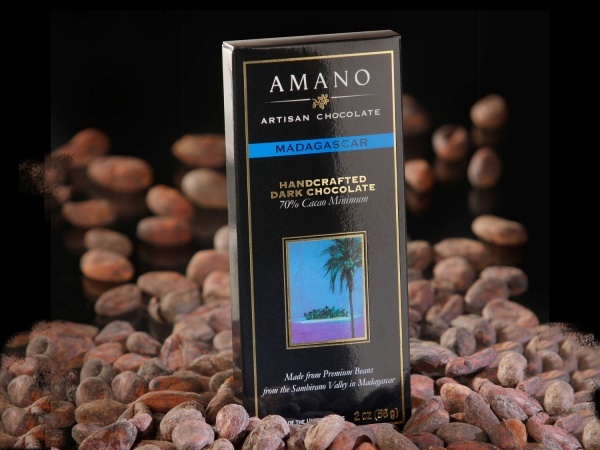 While the cocoa used in Amano's Madagascar chocolate is not mixed with cocoa from anywhere else than Madagascar, additional ingredients, such as vanilla and sugar do not necessarily come from Madagascar. The Madagascar 70% Cocoa Nibs are dry-roasted pieces of the cocoa beans that can be used in cooking, as snacks and in chocolate dishes. Since nibs come directly from the cacao tree, they contain a higher amount of theobromine than regular chocolate products. Theobromine is one of the ingredients contributing to chocolate's reputation as an aphrodisiac. Amano's Madagascar bulk chocolate is used mainly by professional chefs and chocolatiers for their own chocolate creations. This page was last modified on 18 May 2011, at 21:26.